In a perfect world, having a writing editor to rely on would be your preference. If you are lucky enough to be an author with a contract for traditional publishing, editors work on your manuscript as part of your publishing agreement. But in reality, we know that the cost of hiring a professional for editing services such as developmental editing, copy editing or line editing is beyond the financial reach of the majority of writers and self-published authors. There are many self-help, short story and fiction writers using self-publishing today. But it is unrealistic to think that all of them can afford to pay for a freelance editor to help in the writing and editing process. But there is an expectation from readers that when they buy a book or even read a blog post or online news article, that the texts will be perfect. If you read some of the major newspapers online, you will know that even with a professional editor, mistakes can still occur. However, that is not an excuse. You should always be looking for ways to improve your writing, your grammar and style. If you write a book, an article or even if you’ve written a quick social media message, you need to be sure you are using good sentence structure and that your grammar and spelling are error free. For new writers, it can be daunting. Mistakes get noticed very quickly. 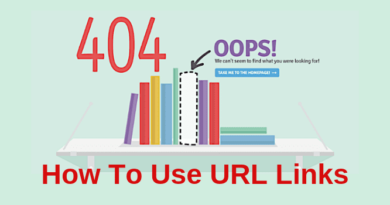 Readers are sometimes not shy at all about pointing out these errors by posting to public online forums such as social media, blog comments or book reviews. So you really do need to learn how to write well, and accurately. You would probably love to have a writing coach or take writing classes. But these are expensive options, and you need to make money before you can spend money. The writing process needs to be a learning experience. So how can you learn to make your writing clear, focused, error free and enjoyable for readers? Experienced writers very often do a quick grammar check, reduce passive voice and find spelling errors by using an online grammar tool. For article and blog writers, who are usually in a hurry, the most popular choice for writing correction is Grammarly. It is a favourite because it works in any browser and also with Microsoft Word. Above all, it is fast and accurate. But for new writers looking for help and assistance, you need more than an efficient grammar checker. You need writing editing software that can help you improve and craft your writing. Sure, you need editing tools, but what you really need are explanations to help you understand where you might be going wrong. A tool that highlights common errors and spell checking is practical, but you want to learn why something is an error and understand how you can fix it. When you know why your sentence structure has a problem, you can then learn and improve your writing much faster. Do you need a writing editor or coach? A coach is someone (or something) that can help teach you how to do something. A standard grammar checker certainly can’t do this. However, there is one program that can give you genuine writing guidance and help you to write much better. If you are new, or even not so new to writing and you have never heard about ProWritingAid (PWA), you should investigate the possibilities it has to offer. Of course, it has a spell checker and grammar suggestion functions. But where it is different is that it provides you with extremely detailed reports that can help you learn and understand how to improve your writing by using a long list of key analysis points. For example, how does your writing rate for stickiness sentence usage? You need to start by knowing what a sticky sentence is first before you can improve. With ProWritingAid, click on “Sticky” in the menu bar, and you will get a report and a link to a detailed explanation. Long sentences can distract, bore or even confuse readers. To check your sentence length, click on “Sentences” and you will get an instant report for every sentence in your text. You can then work to simplify and shorten the very long sentences you have written. 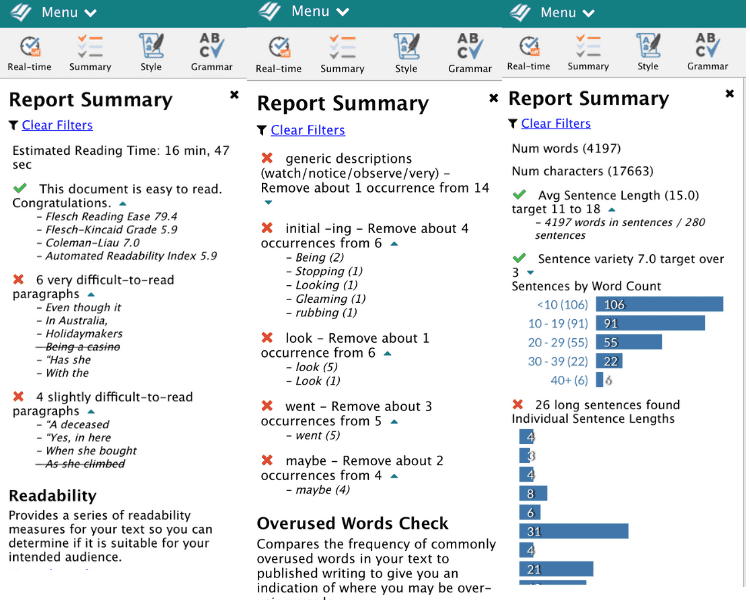 You also get data about your average length and optimal variety for all your sentences. Every writer suffers from overused words. When you read your text, page by page, repeated words are extremely difficult to find and replace. With ProWritingAid, it is again only one click to list all your repeated words in even a very long book-length text. In the left menu bar, click on each item in the list to see a flyout menu and you can jump to the next location of a repeated word in your text. In all, there are more than twenty reports like this available for you to analyse and improve your manuscript or online writing. Okay, it is not a human writing editor or coach. But when you have the choice of an online coach for free or for a very low price, it is a very good alternative for you to consider. If you need to edit books, and can’t afford professional book editing services. it is a fantastic tool because it can do an in-depth analysis of very long documents. Take a quick look at what ProWritingAid has to offer and how it will help you become a better writer. I am sure the first buying option will appeal to you. There is a free version that allows you to use many of the features of ProWritingAid. As with all free writing tools, there are some limitations such as the maximum word count you can check and how many features you can access. However, it works perfectly if you want a quick editing tool and writing check. However, the high-quality premium version of ProWritingAid is extremely affordable, starting at only US$60.00. This is much, much cheaper than many of the other popular grammar and writing programs, so you will get a lot of value for your money. With premium, you can integrate with Microsoft Word, Google Docs, Scrivener and Open Office. There is also an extension for the Chrome browser to work online with WordPress or any other online application or site. If you really want to improve your writing and learn how to write well, ProWritingAid is a very good choice to consider. It is the closest you will get to having your own personal writing coach, right at your side. I use the premium version PWA for all my long-form writing and sometimes wonder how I ever managed without it. ProWritingAid doesn’t replace a proofreader at the end of the writing process, but as an editor and for suggestions to continually improve my writing, it is a real winner.